Moncton is hosting the Skills Canada national competition this week with more than 500 high school and post-secondary students from across the country competing at the Moncton Coliseum. Luc Morin, executive director of Skills Canada New Brunswick, says the "Olympics of the trades" offers students who excel at something other than sports or academics an opportunity to shine. "Some students, whether it be on the debate team or a special athlete, they'll be put on the pedestal, but for these students that can do things such as put a carburetor together in a half an hour ... they don't always get that chance to have this exposure and be put on this podium, so this is what we do for them," Morin told Information Morning Moncton. Luc Morin, executive director of Skills Canada NB, talks about the national competition in Moncton that will draw over 500 youth. 7:49New Brunswick's team is the largest ever with 40 students competing. The national competition is open to the public on Monday and Tuesday from 8:30 a.m. until 4 p.m. The competitions range from welding to baking and in each case the challenge is based on real life or industry–related experiences that replicate what students will see on the job. For instance carpentry students might be asked to build a doll house, while cooks may be asked to prepare a five-course meal. The students are judged on precision, safety, use of equipment and how well they can follow instructions. Bringing the national competition to Moncton is a dream Morin has been working toward for more than five years. 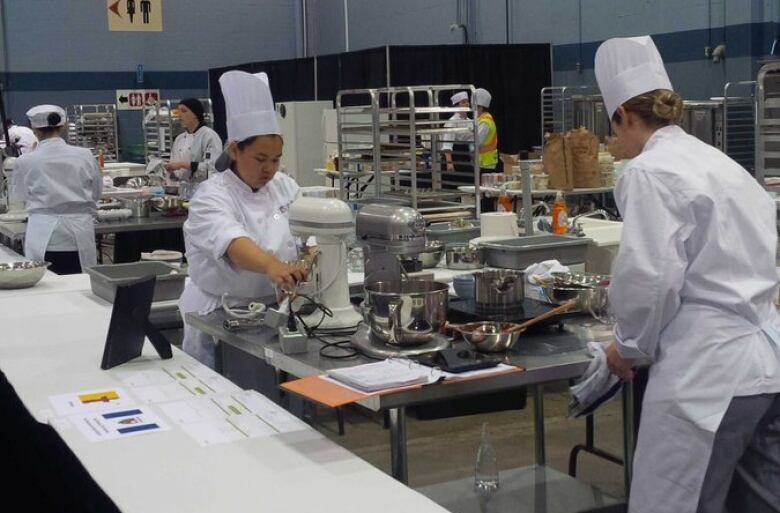 Students are competing in everything from baking to carpentry in the Skills Canada National Competition which wraps up at the Moncton Coliseum on Wednesday. (Mary Butler/Twitter)"What we wanted to do was showcase this to the province because for years we had been sending a team to the national events but we wanted to show it on our home turf," he said. Morin says it is also a way to promote the trades to New Brunswick high school students, many of whom will visit the Moncton Coliseum to watch the competitions over the next couple of days. "We understand the importance of the skilled trades is the bottom line," Morin said. "We want the youth to know, 'Hey — we need you guys. These are great paying jobs and we want you to stay in the province as much as possible,' so that's why we want them to be exposed to this." The event will include many opportunities for visitors to "try-a-trade," with interactive activities such as setting up a power line at the NB Power booth, using an electric jigsaw and mitre saw to construct a key box or building a brick wall.